Four of Butler’s starters circle up in the team’s final exhibition game. The Bulldogs will open their season at home on Nov. 10 against Kennesaw State. 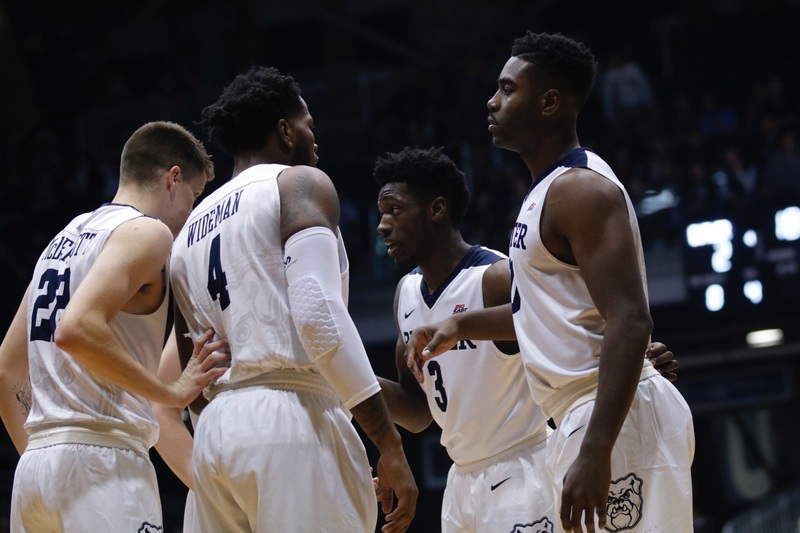 Butler basketball‘s 86-79 win in their final exhibition game was never destined to be easy. The matchup against Lincoln Memorial, a team coming off a Division II Final Four bid last season and runner-up in the 2016 championship game, was just the opponent Butler needed before kicking their season off next week. Bulldog fans experienced a brief period of unease in the final four minutes of play after Lincoln Memorial closed the deficit to four points. Clutching to a 74-70 lead, Kelan Martin took advantage of a series of four free throws to extend the team’s lead to 78-71. Two Kelan Martin free throws give Butler a 78-71 lead with 2:24 to play. Martin now with 19 points. “I was trying to get it in the paint, trying to collapse the defense, trying to get it out, but mainly just being aggressive getting to the basket,” Martin said. Teammates Kamar Baldwin and Aaron Thompson added an acrobatic shot each to create more distance. Both teams scored an 45 points in the second half. Expectations for a physical matchup were set in the first possession after Tyler Wideman outmaneuvered forward Emanuel Terry down low for Butler’s first two points. Lincoln Memorial applied pressure throughout the night, and their efforts yielded two consecutive Butler turnovers in the first five minutes of play. The Railsplitters earned 15 points off turnovers on the night. “We knew and we told our guys, ‘They’re a really good team, their coach does a good job, there’s good tradition,’ we knew it would be a different challenge than last week, and we prepared for that mentally,” head coach LaVall Jordan said. Three-pointers peppered the box score for both sides. After shooting just 21 percent from the 3-point line against Hanover, Butler went 6-for-15 from the arc. Martin dominated both sides of the court, scoring a team-leading 19 points and seven rebounds. Baldwin followed with 17 points of his own while Sean McDermott followed up his 14-point performance last weekend by going 3-for-4 from the arc. Defensively, Butler tallied 29 rebounds as a team compared to Lincoln Memorial’s 26. Butler’s next game opens the 2017-18 season at home in a matchup against Kennesaw State on Nov. 10, followed by a game against Princeton just two days later. Both games start at 7 p.m.